Is one of the fmcg stocks into wellness theme coming out with niche and innovative products. Sugar Free: Indiaas largest low calorie sweetener with over 90% market share. Actilife: is thenutritionalhealth drinks for adults which improves digestion and reduces cholesterol. This company can be considered as a true innovator as they have been successful in creating new product categories in fmcg. It was one of the hottest stocks quoting at around 750 last year but is available at around 400 now. Recently this company has been facing huge competition in Everyuth peel off and scrub. Even though it is a market leader in sugar free, sales have been slowing down. Even though the share has halved in value to 423, its PE is still high at 24. Total sales of the company are still below last year’s value. I feel that this might be an ideal time to watch this stock, if we believe in the brand pull of its products. I had this stock in my watch list for 3 years and was never able to buy it as I felt it was expensive. I would totally appreciate any comments that will help me make my decision about investing in this stock.I personally feel that I should wait till it comes out with quarterly sales of more than the last yearas best quarterly sales figure. Good stock to add below 350 during bad phase in market. Company has to introduce new products on regular basis and should remain in lime light. Sugar free business is facingcompetitionand advertise expenses must be mounting high. As promoters are dynamic and keen to add new products it is ideal selection. Akshay, you are right. Sugar-free is a practical monopoly in the market with all its variants. But the other 2 divisions are dragging the performance down. And till their proportion becomes really low so that they don’t impact growth negatively, the stock is unlikely to outperform. But, it is a good stock to keep on one’s radar. Good news is that this fmcg stock is available at a PE of approximately 17. So for a long term of lets say 5 years, this might be a great time to accumulate this company as decent valuation. 1)The management seems to have become pretty silent. i don’t see any management meets etc or how the new ceo Elkana Ezekiel has been doing since a year. The company has been paying very less tax % around 5 to 10% instead of average 25 to 30%. One of major reason for this may be due to tax holiday for 10 years in its new Sikkim plant which has come up like a year back. The company’s net sales for the quarter ended December 2014 grew by 10% to Rs 107 crore (after adjusting for an excise credit of Rs 6.72 crore). OPM declined by 624 bps to 21.3% on account of higher advertisement spending. The net profit increased by 70% to Rs 45.3crore.Q3 ad spend was higher due to low base. The sugar-free category grew by 9% in CY14. The company maintained its leadership in the segment with a 92% market share.The scrub category grew by 10% in CY14. The company maintained its market share of 31.5% in the category. The peel-off and margarine categories posted a decline of 10% and 7% respectively in CY14. However, the company maintained its leadership in the both the categories. The company’s market share in face wash category is 2.5%. The split-up between sugar free brand of the company - Aspartame and Sucralose is 70-30.The company has cut Nutralite price by 8% at institutional level, but not at retail level.The company launched Everyuth Naturals Advanced Hydro-Active (Walnut Apricot) scrub recently and the initial response for the product is good. The mgmt said that it will not enter into new categories under Everyuth brand, but will introduce new products under that brand. Gross profit margin is likely to improve from the coming quarter due to a reduction in the raw material prices.The company expects the excise duty to be around 5% for FY15, FY16 and FY17. It was earlier 7%.The mgmt said that a new distribution system is in place and expects to reap the benefits from Q1 FY16.The company has cash is around Rs 240 crore. The company is looking at inorganic growth, but presently it has not company in mind. The mgmt said that most of the categories such as sugar-free, scrub and peel-off are under penetrated and niche categories. An improvement in the penetration of these categories along with an increase in the distribution reach would be the key revenue growth drivers for the company in the near to medium term. Zydus Wellness held a conference call to discuss the results for the quarter ended March 2016. The company’s net sales for the quarter ended March 2016 grew by 5% to Rs 116.9 crore . The net profit increased by 28% to Rs 25.8 crore. The net profit is up by 10% of LTL basis after excluding the reversal of additional excise duty credit for the period April to December 2014 done during the same period last year. The company has roll out distribution program called Enrich> The company has increased its direct distribution reach by 20%. The sales grew by 4.5% for FY16 after removing Nutralite price reduction and discontinued products. Rs 396.9 crore is consolidated cash position. Capex for FY16 was Rs 4.5 crore. The company’s market-share in scrub category is 30.7% (MAT Sept.16 report of Nielsen). The company’s market-share in peel-off category is 92.1%, up by 80 bps (MAT Sept.16 report of Nielsen). To support growth expansion plans, a new manufacturing plant is being setup by Zydus Wellness-Sikkim, in Sikkim which is expected to commence production in March 2017. Cost for new plant will be around Rs 35 crore. Gross Margin for Q4 up due to reduction key input cost. Facewash was re-luanch in March 2016. As far as Nielsen, the company’s direct reach is 8.3 lac stroes. Sugar free reach is around 410K outlets and Everyuth brand is 500K outlets. The company will continue to invest behind distribution expansion. The mgmt said that this year it will launch some new products. The market size of sweetener in India is Rs 300 crore, face wash is around Rs 1800 – 1900 crore and butter substitute is around Rs 150-200 crore. The mgmt said that it sees good growth in sugar free, peel off and scrub also. Face wash is under stress. Netralite now back on track. It looks at positive growth across category, leaving face wash on which it is working. Tax rate – 10-12% for FY17. The company is looking for acquisition in India and outside India as well. The company’s net sales for the quarter ended December 2015 grew by 2% to Rs 105 crore . The net profit increased by 7% to Rs 29 crore. Prices has been reduced for Nutralite in institution side while face wash has de-growth which impacted the net sales. 10.5% scrub category grown. The company’s market-share in scrub category is 31.4%. Peel-off category declined by 4.6%. The company’s market-share in peel-off category is 92.1%. The mgmt said that in sugar free category it is continuously trying to get consumer attach to category. Continues marketing initiatives to grow the category. Distribution expanded by 3% on Sugar Free Gold and 15- 17% on Sugar Free Natura. Expects gng fwd, double digit growth in this category. In Nutralite, the mgmt is trying to bring more aware of benefit of this product to consumers. It is also expanding distribution. Bigger challenge to the mgmt is to grow this category aggressively. In Everyuth, it is facing challenges in face-wash. Will take 3 to 4 quarters before cracking this category and re-launching the product. The new introduction in face-wash didn’t work. Trying to gain customer by innovation, activation and increase in distribution in Everyuth. Gross margin expanded due to fall in raw material cost and expects it to be stable for 2 – 3 more quarters. The company has not taken any price hike this year. Sugar-free distribution - pharmacy significant sales come from it, followed by grocery stores. Sugar-free present in 300000 outlets. Everyuth is present in 400000 outlets. Accounting tax rate 10-11% FY16. The company has stop sugar free delight product. The mgmt is looking at new category under sugar free. Good sales growth…probably after 3-4 yrs. And best margins ex-advertising cost. Zydus Wellness is acquiring Heinz India pvt. ltd. Interesting move but don’t think its a great one because the acquisition doesn’t include heinz’s ketchup and mayo business but includes Complan, Glucon-D, Nycil and Sampriti. Last year revenues are at Rs.1130 Cr. and EBITDA of 225 Cr. and Zydus is paying 4595 Cr for this - Roughly 4x Sales and 20x EBITDA. It’s probably not an exorbitant valuation but from what I have read and followed, Malt based energy drinks are on a decline which is why GSK put horlicks on the block earlier this year. Zydus may have got this business for cheap considering GSK was expecting $4 billion for Horlicks (may just be price anchoring) which was roughly 8x Sales for Horlicks. Interesting move by Zydus. Was reading the ET interview of Sharvil Patel. He’s saying products acquired are in leading position in their respective categories specially Glucon D and Nycil. I’ve some questions on the financing of this deal. Purchase price is 4600 cr. 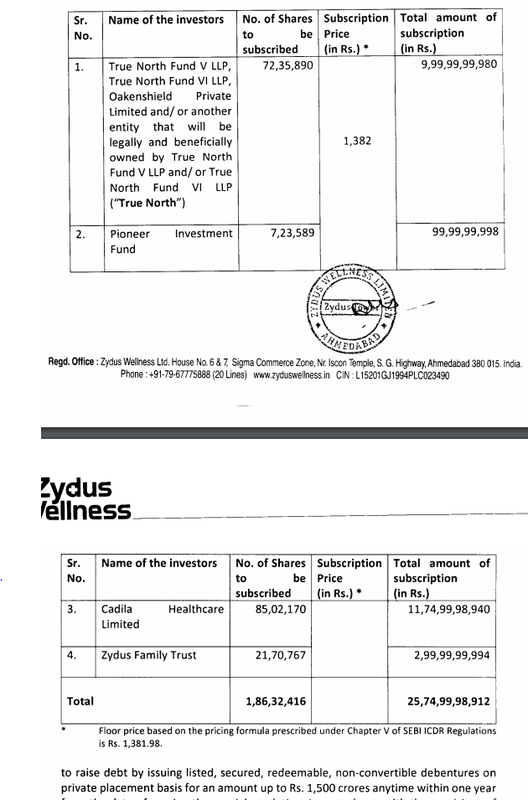 Cadila will pitch in 1000 cr for equity in Zydus (or Heinz)? How much equity will 1000 cr be worth? And rest is through debt and PE guys. What will be the division and again how much equity Zydus is putting up? Of course if acquired products are making 20% EBITDA (despite being leaders in their categories) & Zydus’s current EBITDA is in high 20s, this deal will mean margin pressure. Combine that with the interest on debt and equity dilution, and ratios might suffer somewhat. Waiting for exact numbers & tracking. What will be the final equity structure ? How will the retail shareholders be affected ? Hi…I think you may get some answers from the thread- ’ Zydus Wellness acquisition of Heinz brands '. For valuations, you may refer to post number 6 and beyond. My opinion - yes, it looks undervalued. Specially if we were to value it @ 25-27 times EBITDA …which I would say is not so steep by FMCG standards. There should be descent upside once the dust around the acquisition settles and more so after integration, repackaging ( esp Complan ) and relaunch of the acquired brands. Disc: invested. Buy price : Rs 1160. Timing: 20 days back or so. @basumallick Sir, your views on Zydus Wellness post merger with Heinz ? There was a Disclosure by Cadila healthcare Ltd, that the share purchase is completed and no further action required(confused). So promoter has in-effect purchased Rs 1400 cr worth of shares.